Phosphorus is the least frequent among other essential biogenic elements appearing in the aquatic environment. Therefore, the content of phosphorus in water affects the biological productivity of aquatic ecosystems. In Slovenian lakes phosphorus represents the most common limiting factor in productive processes, for which reason we use the average annual content of the entire phosphorus load as the indicator for the evaluation of the trophic status of lakes or as the indicator of eutrophication of lakes. Inappropriate discharge of urban effluent and leaching of phosphorus from agricultural land are the biggest and most common allochthonous sources of phosphorus in lakes. Therefore, the phosphorus content in lakes depends to a great extent on the density of population and the intensity of land-use in lakelands. The increased content of nutrients in lakes, in particular phosphorus, accelerates the productivity of plankton algae which contributes to a poorer transparency of lakes. The transparency of lakes, which is measured as the Secchi depth, is therefore used as the auxiliary indicator of the status or productivity of lakes. A decreased transparency of lakes affects the appearance of lakes, limits bathing and other sporting activities on and by the lakes. Care for a better status of aquatic environment is one of the priority areas of the National Environmental Action Programme. The fundamental objective of the Water Framework Directive (2000/60/EC), to which also relate the Water Act (OJ RS No 67/2002) and the Decree on the Chemical Status of Surface Waters (OJ RS No 11/2002), is the improvement of ecological status and potential of all bodies of water, which also includes the catchment areas (drainage basins) of lakes where it is necessary to decrease the input of nutrients in lakes, in particular phosphorus, by means of appropriate measures. In Europe, the number of lakes with lower phosphorus content and greater transparency is increasing as a result of measures affecting the decrease in the burdening of lakes from lakelands. A similar trend was also perceived in larger natural Slovenian lakes. In Lake Bled and Lake Bohinj, the only two bigger (>0.5 km2) permanent natural lakes in Slovenia, the phosphorus content has been decreasing over the last decade and remains at the same level as in previous years. The decrease in phosphorus content is more pronounced in Lake Bled where the first remedial measures, including the upgrading of the sewage system, were implemented in the beginning of the 1970's. The improvement of status and decrease in the trophic status of Lake Bled is also evident from the average annual transparency of the lake which has been gradually increasing. The lakeland of Lake Bohinj extends to the mountain karst area where the effects of human activities are limited, for which reason the phosphorus content and the productivity of phytoplankton are low in Lake Bohinj. With the permanent increase in tourism at Lake Bohinj, the establishment of a sewage system (2000/02) constitutes a necessary preventive measure, despite the good status of the lake. The transparency of Lake Bohinj at high flow rate points does not depend solely on the density of phytoplankton, but also on the quantity of inorganic floating particles which are being introduced into the lake from swollen streams and torrents especially during storms. For this reason transparency is not a thoroughly adequate auxiliary indicator of status in this particular case. Due to the constant drying up, Cerknica Lake represents a special aquatic ecosystem that cannot be compared to permanent lakes, such as Lake Bled and Lake Bohinj. Due to the aforementioned drying up of the lake, there appear no problems of excessive burdening by nutritional substances and eutrophication relating thereto. In the period during which Cerkniško polje, rich in its dense wetland vegetation, is flooded, the vegetation constitutes a natural purification system which consumes nutrients that are being introduced into the lake from tributaries. The system, which functions as a big biological purification facility, stops functioning upon the drying up of the lake. Then, the water accumulates only in the bed of the Stržen River and its quality is poorer than in the period of greater ponding. The water level fluctuation also affects the fluctuation of phosphorus content in the lake which has not increased in the period from 1992 to 2002, i.e. globally speaking. Irrespective of this fact, the Cerknica Lake catchment area requires appropriate measures which would reduce the burdening by nutrients, in particular faecal pollution of certain tributaries. Due to the shallowness of the lake and rich wetland vegetation, transparency does not represent an adequate auxiliary indicator of the status of Cerknica Lake. In the period from 1992 to 2002, all bigger natural lakes of the Republic of Slovenia (Lake Bled, Lake Bohinj and Cerknica Lake with tributaries) were included in the regular national monitoring of the lake water quality. The Standardised Database for Water Quality Monitoring, Environmental Agency of the Republic of Slovenia, Monitoring Office, Water Quality Section (Relational Database). The lake water quality monitoring is being implemented under the standard procedures that comprise of sampling and individual analyses. 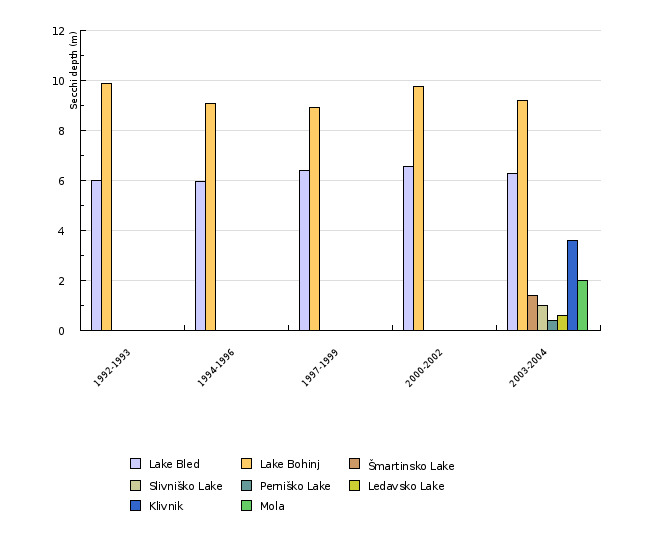 The samples for the analysis of the entire phosphorus load were taken from Lake Bled and Lake Bohinj during monthly intervals at two and three, respectively, intake points, at every two and three, respectively, meters of depth according to the vertical depth. We submitted the data on the average annual content of the entire phosphorus load which we calculated by taking into account the volumes of individual depth layers (the average of measured phosphorus values in a depth layer X depth layer volume). Conditions are different at Lake Cerknica, i.e. the sampling is not implemented according to depths. 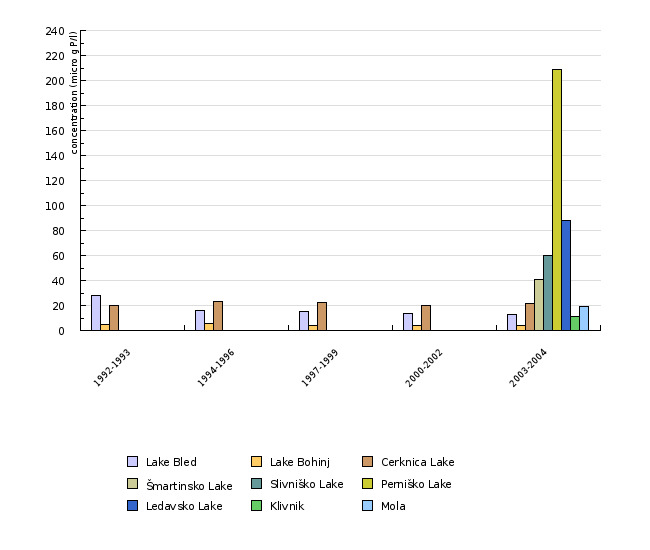 The data on the entire phosphorus load that we submitted is the annual average of individual measurements carried out at different locations at Lake Cerknica. Eurowaternet lakes (average summer-time content of the entire phosphorus load). The data on phosphorus content in European lakes take into consideration the EEA countries. Due to the heterogeneous distribution and different types of lakes, the comparison between the countries is unreliable.